The Global Savings Group, a leading global provider of Commerce Content solutions, takes a Top-10 position in the FT 1000, the list of Europe’s Fastest Growing Companies, compiled by Statista in cooperation with the Financial Times. Munich, April 06, 2018 – The Global Savings Group (GSG), a leading global provider of Commerce Content solutions for publishers, took the ten’s position in the FT 1000 list, compiled by Statista in cooperation with the Financial Times. 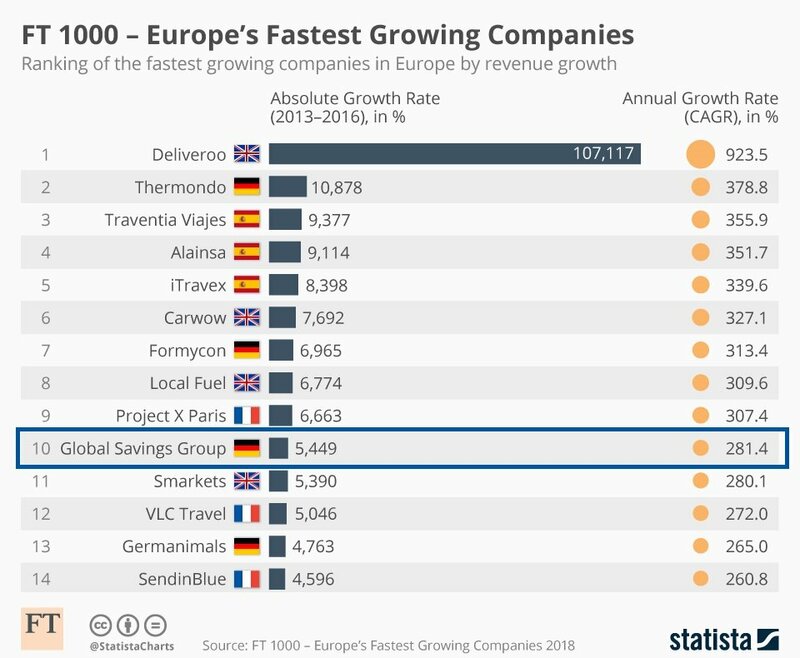 The FT 1000: Europe’s Fastest Growing Companies is a list of the top 1000 companies in Europe. The FT 1000 lists the companies in 31 European countries that have achieved the highest compound annual growth rate in revenue between 2013 and 2016. The list is compiled for the second time by the statistics portal Statista in cooperation with the Financial Times. The ranking is based on an analysis of revenue and staff growth of independent companies headquartered in Europe. This revenue growth has to be primarily organic and not due to acquisitions. In this period GSG achieved an absolute revenue growth rate of 5,449% and a compound annual growth rate (CAGR) of 281.4%. Following to this growth, the company achieved profitability and secured USD 23m (EUR 19m) in financing to strengthen its global offering. GSG was founded in 2012 by Andreas Fruth, Gerhard Trautmann, and Adrian Renner. The company is operating +100 digital portals and tools, that offer the right mix of product discovery, recommendations, deals and discounts to help consumers take smarter shopping decisions, whilst enabling advertisers to reach high-intent users at scale, and the world‘s most well-known publishers to unlock the real value of their audiences and assets.